Renova Group’s managers charged with giving $16.5 mln in bribes | Russian Legal Information Agency (RAPSI). MOSCOW, August 3 (RAPSI, Lyudmila Klenko) – Yevgeny Olkhovik, a co-owner of top Russian group of companies Renova, and Boris Vaynzikher, CEO of Renova’s subsidiary, T Plus Company, have been charged with giving about one billion rubles (about $16.5 million) in bribes to officials of the Komi Republic, an investigator said during court hearings on Thursday. 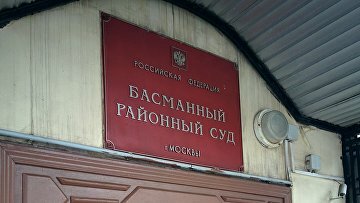 The Basmanny District Court of Moscow is reviewing a motion of investigators to extend the defendants’ house arrest. On August 1, the court released Olkhovik and Vaynzikher from detention. Earlier, a criminal case was opened against some former and acting managers of Kompleksnye Energeticheskiye Sistemy (KES) company, of which T Plus is the legal successor, over alleged corruption. At that time, the offices of the company’s parent holding Renova were also raided. Three men holding CEO posts in the KES at different time, Olkhovik, Vaynzikher and Mikhail Slobodin are involved in the case. Vaynzikher and Olkhovik were initially put detention. Slobodin, ex-head of the telecommunications giant VimpelCom, has been arrested in absentia. In late July, Russia’s prosecutors turned to Interpol asking it to issue a Red Notice for Slobodin. According to investigation, between 2007 and 2014, the defendants bribed officials currently involved in the case against ex-head of the Komi Republic Vyacheslav Gaizer. Earlier, investigators claimed that Olkhovik and Vaynzikher had allegedly received 177 and 89 million rubles (about $4.5 million in total) in bribes respectively during their management in the Kompleksnye Energeticheskiye Sistemy and transferred the money to the accounts of affiliated companies.